Announcing a fresh screenshot from the upcoming v0.8 beta of the project. We admit that many assets still need repairing, but it is a giant step forward from what was before. Much more better than the previous one I played!! Another big conversion problem solved by feanor and me lately. Finally, the maps will have beautiful, multi-colored Heroes 2 flags! Any suggestions on the rest 2 player colors are welcome. Black and white, maybe? That would be original. I tried some with paint, only left flag of each "gate". For the 3 firsts i used colors of others flags, but for the last 4 I used colors from paint. Can we change the flag shape? 1/ just black vertical lines. 4/ drawing a dark blue H on the yellow flag. looks pretty cool. Yes, definitely. We have got 16 maintenance colors so practically we can make anything. However, classic flags are to remain classic in the project. We might create specific objects with beautiful medieval-styled colored banners though. This feature can be nice for custom maps. Yes, we can. But we are not going to do so because the black border was in the classic game and provided fitting for all flags on all terrains. Also thought about these ones - Heroes 3 beta actually intended these colors, and we can notice that in Keymaster's Tents. Currently we tend more towards turquoise and black. White can be easily mistaken with grey. I see some interesting discussion about a trebuchet for the knight going on in the DF2 forum. Do anyone want to tell us non-russian speakers about it? 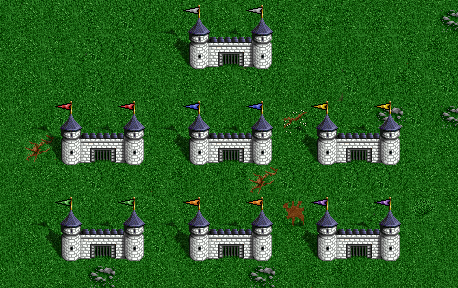 As we know, the Knight will not have flying creatures in his lineup, which might make sieging castles for him harder. We think about an improved version of the catapult for this class, with more hp, two shots and maybe a different exterior. The class basic skill is going to be Leadership, but Knights will be able to receive Ballistics starting from level 3. It should be used for various promo screenshots as well as in new main menu screen. Is the grey background supposed to be translucent? Of course. The logo is necessary primarily for promo screenshots, info source web design and main menu. 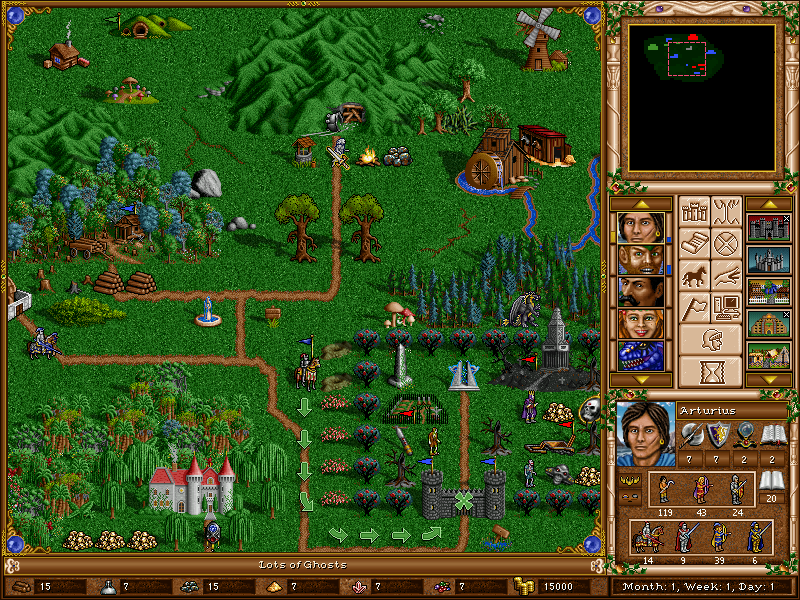 This means that i must install first only Homm3 if i want or Shadow of Death, Heroes Complete ? I recommend to wait until the next version. It's not too much to wait. To install the next version of the mod, you will need clean Heroes Complete from GoG.com. 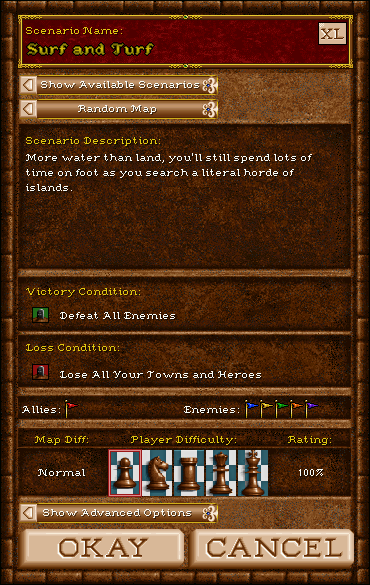 Do you remember all those fancy HoMM2 fonts? As the other graphic elements of that game, they certainly added a lot to the comfortable fairy-tale atmosphere. 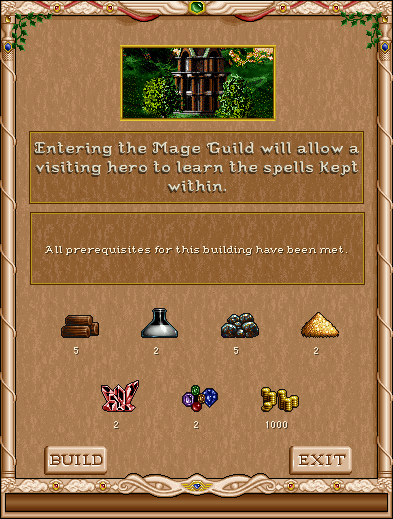 H3SW Team was successful in implementing the fonts to HoMM3, creating the new font format. Now we can not only reproduce the original HoMM2 letters, but also design our own new elements to enrich the game's graphics. The prototype of such font can be seen on the first picture in the map name! For those who does underestimate the importance of the presented update, we should clarify: the native HoMM3 fonts are monotonous and don't support half-transparent shadows and soft color transitions. 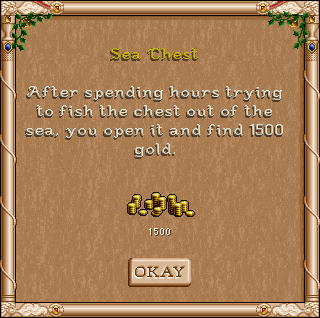 Considering this aspect, they give in to HoMM2 fonts which look good even on beige backgrounds. It all looks very gorgeous! One thing though; the gold font which spells "Surf and Turf" seems a bit blurry to me. The other fonts stand out clear and sharp, but this one is a bit less clear for me. Maybe it should be sharpened a bit? It is only a minimum of two shades of yellow. There is no "ms dos" for Heroes 3, Roarkes. I just read the plan for our coming releases on HC and I must say you got it all very well organised. The content of each versions seemed to be realistic regarding our work progress, so I hope the best. I am currently continuing the work on the resizing of the barbarian portraits and they will be finish quite soon. Yes, the fonts look fantastic! And even though I didn't realize why until now, the default H3 fonts were a big part of what made H3 look drab compared to H2. The colour scheme too, but you can't underestimate the big difference great fonts make compared to poor fonts! I just read the plan for our coming releases on HC and I must say you got it all very well organised. The content of each versions seemed to be realistic regarding our work progress, so I hope the best. I am currently continuing the work on the resizing of the barbarian portraits and they will be finish quiet soon. Yeah. I planned to send it to the team members via PM, but I didn't have time. Sorry for that. We can discuss the plans here - perhaps someone has better suggestions for what to have in our next releases. The approximate plans for milestone releases can be currently presented as following. v0.8 beta: First stable release. Redesigned artifact system. Completely redesigned faction hero roster. Redesigned hero system. Completely remade Knight and Dervish townscreens. Completely re-packed map objects and terrains. New Witch castle opera soundtrack. Completely redesigned game menus and interfaces. 10+ our new creatures (in static form) to replace the placeholders of old versions. Severely revised (if not re-done from scratch) game script file. New mod installation system. Blocked WoG options. Dozens of other new features. v0.9 beta: Further polishment. Redesigned magic system. Further graphic updates and enrichment of the map list. Final versions of castle lineups, new creature animation. Balance improvements. New Dervish castle opera soundtrack. Chances to be released: very good. v1.0: First official complete release. 95% of game graphics presented in final or pre-final development stages. Roland and Archibald's campaigns put for the first campaign section. Final graphic improvements, several new graphic assets, final conversions of Heroes 3 objects. Complete H1-H2-H3 map list + (probably) several new ones with the maximum object diversity. (probably) the ERA minimod concept to replace WoG options completely. Chances to be released: good. v2.0. Second official complete release. New objects (Castle-styled Garrisons, Walls, etc., etc.). The Heretic faction. The second campaign section "The Mandate of Heaven" containing new campaigns covering the further storyline of Enroth and featuring the Witch, the Dervish and the Heretic castles. New maps featuring the maximum object diversity. Heretic castle opera soundtrack. (probably) Further development of the ERA minimod concept for gameplay customization options. Further balance improvements. Chances to be released: medium. v3.0. Third and final official complete release. New objects. The 10th faction. The third campaign section featuring new campaigns which are to cover the newest history of Enroth. The glorious end. Chances to be released: unknown. Oh yeah. I can't imagine what would happen to Mister Kalu's development without these fonts. I recall him trying to place it as a whole picture, but that is really a mess. The project needed a professional programmer, and fortunately, feanor is.